The Château de Valençay is a château in the village of Valençay, to the east of Loches and in the quiet countryside of the Indre département to the south-east of the Loire Valley. Although it is slightly remote from most of the famous Loire Valley castles, the Chateau de Valencay is one of the most grand among them and further enhanced by the very impressive gardens that surround the castle, with meticulously maintained French style gardens close to the main buildings, and a more natural 'english style' park a little further away. 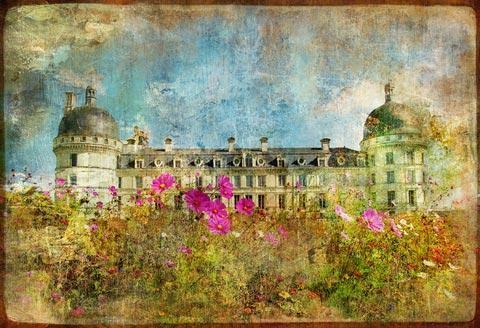 France This Way commentary: rather like the Chateau de Cheverny, the castle at Valencay doesn't excel at one thing but it is the combination of gardens, architecture and interior decoration that together make it a fascinating castle to visit. The castle was originally built in the 15th century by Robert II d'Estampes on the site of a manor house, then substantially rebuilt in the renaissance style popular at that time the first half of the 16th century (by the same Estampes family). 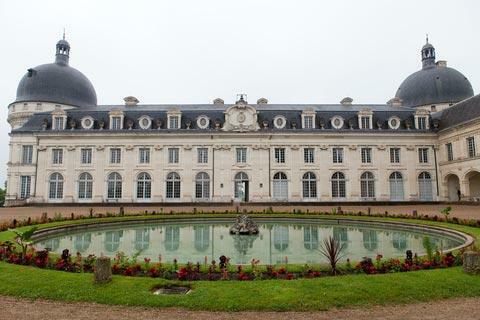 The Chateau de Valencay was subsequently acquired in 1747 by the Scottish banker John Law, a fascinating character who was a brilliant banker, but who was also responsible for the virtual financial collapse of France in the 18th century in what became known as the Mississippi Bubble (not unlike the financial 'bubbles' that we have seen in recent years, that usually result in serious financial troubles when the 'bubble bursts'). In 1803 the castle was purchased by the diplomat Charles Maurice de Talleyrand - one of Napoleon's most important ministers. It was at this time, when Talleyrand was entertaining the great and the good among the leaders of Europe in the castle, that King Ferdinand VII of Spain and his family were held captive for several years, on the orders of Napoleon. During the Second World War the château was spared by the German Occupation as its owner, the Duke of Valençay, established his personal neutrality as the Prince of Sagan. By this fashion some important treasures that had been evacuated from the Louvre in Paris (such as the Winged Victory of Samothrace and the Venus de Milo) were safely stored here during the war. The castle was originally a long building with a substantial tower at each end. An additional wing was then added in the late 18th century, the wing and the original castle together half-enclosing a formal courtyard containing a large circular pond. Although this new wing is in a more classical style than the original castle, the two blend together very harmoniously. The imposing castle keep at Valençay appears medieval and as if it once had a defensive function but in facet it was built in the 16th century and never served a military purpose: it was simply built to appear imposing! As you walk around the outside of the castle you can see numerous features that are characteristic of the renaissance period, such as the decorative stonework around the windows. On the more recent wing the characteristic most tpical of the classical style is the pilasters (false columns inset in the walls). 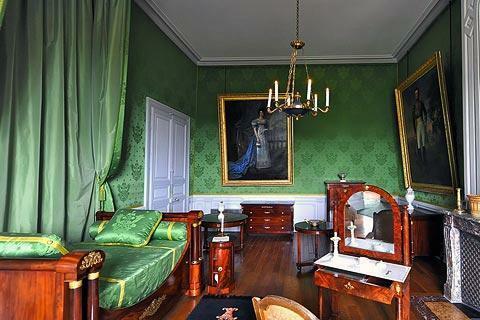 Inside the castle you can see numerous finely decorated apartments, many featuring the rich furnishings added by Talleyrand to impress foreign dignitaries, and including the apartments where the King of Spain was held - in some considerable luxury - during his time of imprisonment. For example, the theatre in the castle was built for the entertainment of the prisoners. 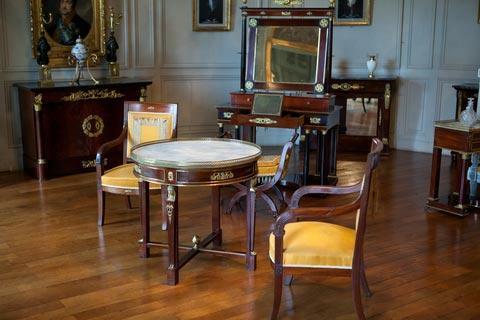 There are numerous works of art, sculptures and historic furniture in the rooms at Valencay that add greatly to a visit and give the impression that Talleyrand still lives somewhere in the castle. Highlights include the Grand Salon and the Blue Salo as wel as the bedroom of the Duchesse de Dino, the niece of Talleyrand. The other side of life in the castle can be seen in the large kitchens and in the Guard room that is part of the original castle that stood here in the 13th century. After exploring the inside of Valencay Chateau you can explore the extensive gardens and park that surround the castle. Close to the castle the gardens are formal with sculpted hedges and classical style water features. Further away, in the park, there is a walk of around four kilometres that passes several places of interest such as the ice houses where ice was stocked. If you prefer not to walk you can ret a golf cart to tour the park. The castle is open all year except Christmas Day and New Year. The price of entry is around 13 euros. There are a few other sites of interest in the village of Valençay next to the castle. To the west of Chateau de Valencay you can explore more of the Loire Valley castles. You can find more local travel ideas in the Indre guide and the Loire Valley guide.